Robert Parham had a good column yesterday at Ethics Daily that exposes problems with a popular YouTube video. The video, which has been posted by many Christian bloggers, attempts to scare people about Muslim demographics. The problem, as Parham details, is that many of the numbers used in the video are greatly exaggerated and inaccurate, which thus undermines the claims of the video. Another problem that could have also been mentioned is a suspect quotation attributed--without a source--to Muammar al-Gaddafi. It seems quite unlikely he would use the FoxNews phrase "homicide bombers" instead of the more accepted "suicide bombers." A google search for the quotation only brings up a few blogs, most of which are clearly quoting from this video. Christians should be careful not to spread misinformation, especially when it is intended to use fear to harm our neighbors. Just because someone made a video and posted it online does to mean it true! I watched the video and read Parham's piece. And it looks like a great deal of the controversy comes over the sources of the video's claims. 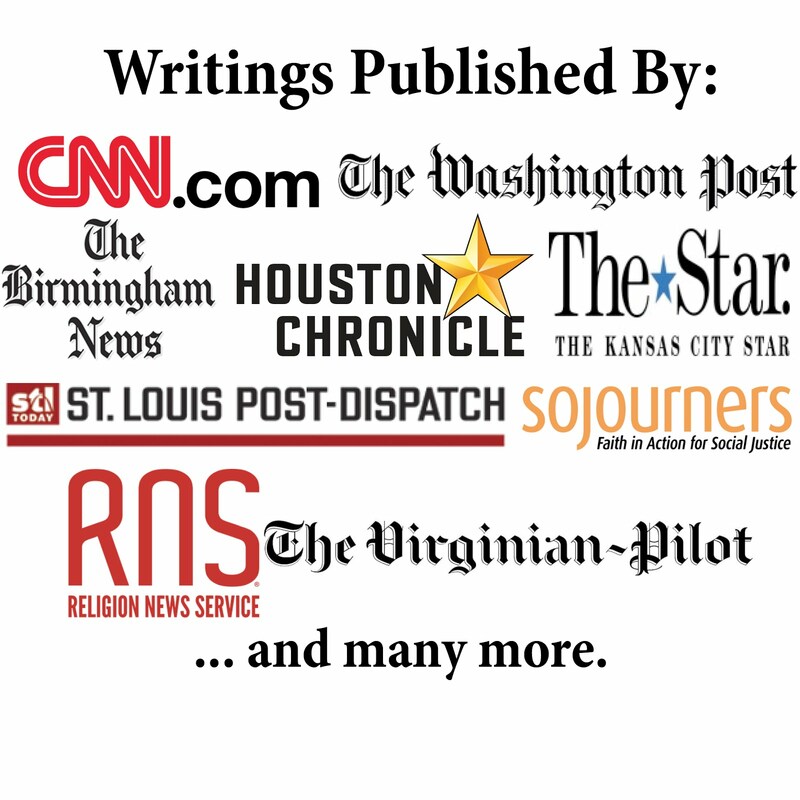 The are at odds with the sources that Parham cites. However, some of the statistics are not that far off (at least in terms of birth rates - and mostly Parham picks and chooses which stats to object to, leaving us wondering if some of the statistics were indeed accurate), so the idea of "greatly exaggerated" is a bit exaggerated itself. It is the MEMRI site (the Middle East Media Research Institute), where they posted a transcript (and supposedly offer the video, though I could not access it) of Al-Qadhafi's 2006 appearance on al-Jazeera T.V. In it he claims that, "We have 50 million Muslims in Europe. There are signs that Allah will grant Islam victory in Europe - without swords, without guns, without conquests. The fifty million Muslims of Europe will turn it into a Muslim continent within a few decades." It appears it's been redacted, so it's not clear whether the line about the homicide bombers was in this speech or not. It may be a combination of two separate quotes or similar quotes. In either case, the essence remains the same. So when you speak about Christians spreading misinformation, I think it's equally problematic to jump to conclusions regarding what is misinformation and what is not. Clearly this video does offer some points of truth, points we should indeed be worried about. Calling it "fear-mongering" isn't necessarily accurate. The truth that Al-Qadhafi seriously hopes to take over Europe should be known to all people and it should cause us to contemplate the implications of this (as well as the disproportionate birth rates in European countries). D.R. : Thanks for the comment and thanks for proving my point. You could not find the "homicide bombers" line. I didn't say the whole quotation was incorrect, but that part. I have real trouble trusting someone who would make that part up. Therefore, my argument still stands. As for the numbers, I find it funny that your best defense for the video is that "some of the statistics are not that far off." So, we should give them a pass because they almost got it right? Even Snopes.com (one of the best sources for discovering if online claims are true or not) has criticized the video for being misleading (http://www.snopes.com/politics/religion/demographics.asp). I didn't prove your point in any way. What I said was that the quote I found was substantially the same as the one you criticized. I noted that some of the transcript had been redacted, suggesting that this part may have been an original part of the quote, but had been taken out by MEMRI. I also noted that the quotes may have been combined from different sources. It could even be a different speech that the video quotes. In any case, the essence of the quote remains the same - that Al-Qadhafi really believes that Muslims will take over Europe without the need of wars due to sheer numbers. You said, "I have real trouble trusting someone who would make that part up. Therefore, my argument still stands." Actually, your argument doesn't stand - it falls with the reality that despite some issues with the exact accuracy (which, as you even note, you can't prove is not true - you just couldn't find a source - that I found in less than 20 minutes by the way). What you are doing is ignoring what is essentially true in the article - that the birth rates of Europeans are far below that of Muslims and that in the not too distant future, Europe will be overrun by Muslims, possibly leading to rule of those countries by Sharia Law - something we should all be worried about. Finally, no one is asking for a pass for an inaccuracy in the video - however, do you ignore all the evidence simply because you can't prove some of it, or because some sources disagree with others? And then disparage the source as being harmful to Muslims and essentially false? When you honestly look at the video the problem is not the possible problems with statistics and exact quotations, but the fact that a radical Muslim leader is endorsing the takeover of a continent and hoping to use it to accomplish his agenda. I just can't believe you would ignore that much larger point and instead seek to disparage the source. The reality is that the essential truths that this video sets forth have been confirmed over and over again for the past 3 years from various sources. All you have to do is an internet search to find the info. But then again, if your previous searches on this article are any indication of how you would go about it, then I don't imagine you'll be able to find the facts about my assertions either. See a debunk of this faked video (although funny, especially the 8.1 children/woman fertility rate of Muslims in France) in Tiny Frog, Muslim Demographics, 2009-05-03, and Duncan Macleod, Muslim Demographics on YouTube Abuse of Statistics, 2009-05-11. "The reality is that the essential truths that this video sets forth have been confirmed over and over again for the past 3 years from various sources." What you mean by "the essential truths that this video sets forth"? Which sources are you talking about? "All you have to do is an internet search to find the info." "But then again, if your previous searches on this article are any indication of how you would go about it, then I don't imagine you'll be able to find the facts about my assertions either." Did you do the search and see that what I said about Muslims overrunning Europe through immigration and childbirth was true? Are you willing to admit I am right instead of trying to divert attention with your attempt at an ad hominem argument? Now, as to the article you linked, they seemed to substantiate one claim that I made, namely that the fertility rates the video cites are quite close to the actual numbers. In the article on Tiny Frog after showing the still on the birth rates of various European nations it states, "These numbers are almost right. It’s true that these nations are declining in population." Then it goes on to show the similarities between the numbers given on the slides and those given by the CIA Factbook. Now, what the article, Robert Parham, Brian Kaylor, and you seem to ignore is that the disparity in numbers could be related to the fact that if indeed the birthrates of Muslims in these countries is high (and the article you cited notes that while 8.1 seems high, it could be correct, given that Yemen's birthrate is 6.41), then it could be that if you take out the birthrates among Muslim populations, then 1.8 could be what remains of the French population (same with the rest of Europe). This would probably adequately explain the differing numbers. Also, the Tiny Frog article seems to ignore that France has universal healthcare and relatively low infant mortality than other Muslim countries that it surveyed. This could explain why birthrates among Muslim immigrants could be higher in France than other Muslim countries (not to mention any intentionality on the part of the immigrants to have more children). There are other problems with the Tiny Frog article, as well with Parham's and Kaylor's objections. But I will settle with that for now. I made the search and found that what you did said about Muslims overrunning Europe through immigration and childbirth seem to be wrong. "Are you willing to admit I am right"
"the article you cited notes that while 8.1 seems high, it could be correct, given that Yemen's birthrate is 6.41"
No. Tiny Frog wrote "This claim is almost certainly false. First, there isn’t a country in the whole world that has a fertility rate of 8 children, so I doubt that millions of Muslims in France’s are having that many children. You can quickly pick out that France’s Muslim immigration comes mainly from four countries: Morocco, Algeria, Tunisia, and Turkey. What are the fertility rates in these countries? 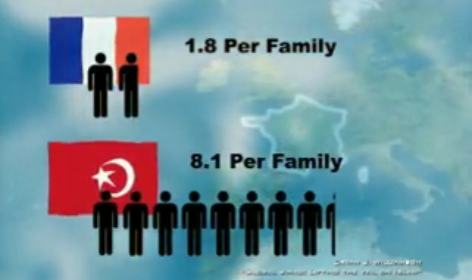 Now, it looks very suspicious when they claim French Muslims are averaging 8.1 children per person." "it could be that if you take out the birthrates among Muslim populations, then 1.8 could be what remains of the French population (same with the rest of Europe)." Yes it could be. But the fertility rate of Muslims in Europe is lower than 3 children/woman. See Mary Mederios Kent, Do Muslims have more children than other women in western Europe?, Population Reference Bureau, February 2008, especially the "Fertility Decline in the Netherlands Among Women Born in the Netherlands, Morocco, and Turkey, 1990 to 2005" figure, and the fertility rate of european countries with muslim majority population like Albania, so it is unlikely (if there were 10% Muslims in France with 3.0 children/woman it would increase the average fertility rate by ~ (3.0 - 2.0) × 10% = 1.0 / 10 = 0.10). See also Tiny Frog's paragraph about the claimed (by the video) 1.6 children/woman fertility rate among white people in USA. "Also, the Tiny Frog article seems to ignore that France has universal healthcare and relatively low infant mortality than other Muslim countries that it surveyed. This could explain why birthrates among Muslim immigrants could be higher in France than other Muslim countries"
Could be. The French are proud of their family policy (several billion euro/year). D.R. : Actually you did prove my point. Let me help you see it. I said Al-Qadhafi didn't say "homicide bombers." Then you said you couldn't find him saying that. Ergo, you proved my point. I didn't say the whole quotation was wrong, just that part. But since they would make up part of it then I cannot trust them as a source. If he made this claim, it should be documented somewhere prior to this video. You will have to look for more than 20 minutes to find that part of the quotation. Oh, wait, you probably won't find it. After all, why would Al-Qadhafi use the recent biased language of his critics instead of the phrase that has been used by nearly everyone else for years? It doesn't make sense for him to use that phrase. I love how you try to dismiss the problems as just "some issues with the exact accuracy." Ha! As in they made stuff up and didn't provide a source. If a student in my intro speech class used this video as a source, it would hurt their grade because it fails several tests of what makes a credible source. Now, if they quoted some of the sources cited in the video, they could be fine. I'm not saying everything in the video is wrong. But, there are enough problems that we should not trust it as a source. So, thanks again for proving my point! Nicolas: Thanks for providing additional links to show problems with this video. I find it odd that people would trust an anonymous YouTube video with exaggerations and outright fabrications. That does not mean that everything claimed in the video is wrong, but we should not trust this source.